The Warshaw Molecular Motors Group has two research foci directed at the structure and function of molecular motors and cytoskeletal proteins that modulate these motors’ ability to generate biological movement, ranging from muscle contraction to intracellular vesicular transport. One research focus investigates how myosin molecular motors operate individually or in teams to transport intracellular cargo, such as insulin granules, along the cell’s actin superhighway. 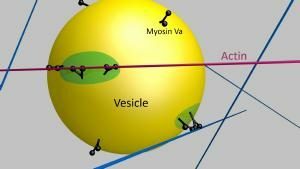 Another research focus is directed at how muscle myosin’s interaction with actin is regulated to generate the force required for both the pumping action of the heart and the contraction of skeletal muscle. Specifically, we study how myosin binding protein-C (MyBP-C) modulates myosin’s mechanical power through its binding to both myosin and actin. Genetic mutations to MyBP‑C causes hypertrophic cardiomyopathy, a devastating disease that results in sudden death in young individuals, as well as Distal Arthrogryposis in skeletal muscle. 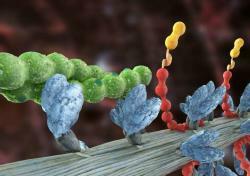 However, MyBP-C’s molecular mechanism of action is far from certain. To address these two areas of research, we take a comparative approach by studying myosins that differ substantially in both their structural and functional capacities in order to match their physiological roles in biological motion. In addition, insight can be obtained from genetically mutated myosin motors and their modulatory protein, MyBP-C, that lead to inherited forms of human heart failure and skeletal muscle disease. With these model systems, we use the power of molecular biophysics and single molecule techniques to characterize the molecular performance of the actomyosin motor and its modulation by MyBP-C.